Know your Exit | InstantEVAC » Evacuation Maps, Signs, Plans. not just evacuation maps anymore ! We assist you in the creation of your facility safety maps. Whether your facility drawings are electronic or paper we will work with your specifications to provide easy to read affordable evacuation maps/layouts. We offer many types of maps and layouts. Our choices include evacuation routes with life safety symbols; hazardous material locations, severe weather, utility layouts, and many more. 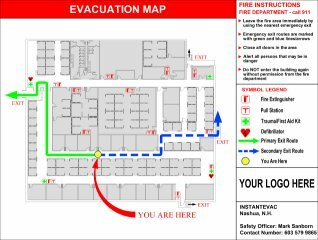 Our maps are designed to assist employees and visitors in the safe evacuation of your facility. Whether it be for a fire, hazard spill, utility malfunction, or just space planning we can map/layout your facility information. Dolor sit amet, consectetur adipi-sicing elit, sed do eiusmod tempor incididunt ut labore et . Principal Janis Phelps of InstantEVAC, a wholly owned subsidiary of Terminal Velocity FM. 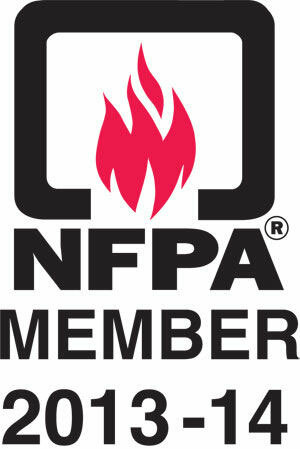 reported today " I am pleased to have renewed my membership in NFPA. We take safety seriously at InstantEVAC and are consistently studying Life Safety Codes. We are here to offer the best CAD drafting services to all of our clients. 2017 has had a great first quarter! InstantEVAC, a wholly owned subsidiary of Terminal Velocity FM, announced today the acceptance of most American Express, Mastercard,Visa, and Discover cards. Principal Jan Phelps commented "We are pleased to extend this much anticipated service through SquareUp to accept online processing of credit cards. We will also still accept invoice payments via mail, just as before. We hope this wil help our clients get the services they need in the easiest fashion for them"